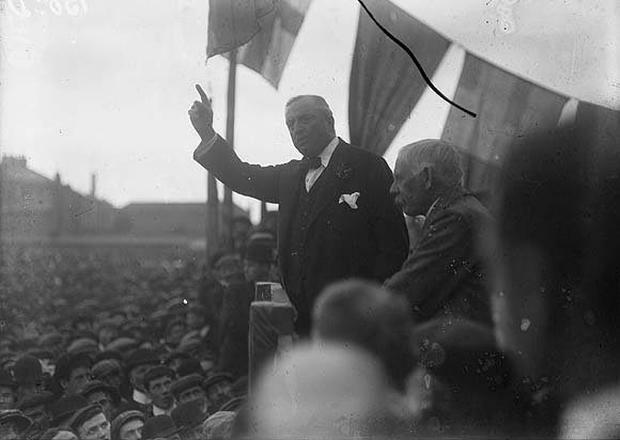 John Redmond, addresses a rally on Home Rule. He encouraged Irishmen to enlist in the British Army. Europe was ravaged by World War 1. But perhaps it is only now, with the distance of time, that we are able to appreciate and understand the impact this human tragedy had on Ireland. With the centenary of the war's outbreak almost upon us, this two-part series aims to explain the causes of the war, Ireland's role in it, the awful cost and the enduring legacy it left behind. It doesn't seek to glorify the aims or objectives, simply to remember that at the heart of the conflict were ordinary people and a great deal of suffering. With contributions from top historians, poignant archive photographs and the family stories of Irish Independent readers, we hope the supplements serve as a useful learning tool for young and older readers. Some of the material we have gathered is featured in a special section on independent.ie – with extra photographs and video contributions from our writers and readers. The conflict saw over 200,000 Irish people sign up. Official estimates put the number of Irish dead at 49,000. It's a stark, heart-breaking number. All died in a brutal four year-period, mown down in their prime on mainly French and Belgian battlefields. The conditions, as we will see next week, were almost unbearable and it is difficult for young people today to grasp the sheer scale of the losses. To put it in context, and it's certainly not to lessen the gravity of the situation, the North's Troubles claimed almost 3,000 lives over a roughly 30-year period. World War 1 wiped out an entire generation of young men, the flower of youth extinguished. Sixteen million people, including civilians, died and more than 20 million people were wounded. The war was fought, of course, on a huge scale and the armies involved were vast, staffed by millions of conscripts, and in the case of Ireland, many willing recruits. As we learn in these pages, they came from every Irish village and town and signed up for different reasons; some enlisted to escape grinding poverty, others to maintain family honour and still more holding the simple belief that German aggression had to be faced down. Irishwomen too played a prominent role, with many operating close to the frontlines as nurses and medics. Though the Easter Rising was just two years away, it's clear many people were relatively comfortable with Ireland's role within the United Kingdom. Dublin was regarded as the second city of the empire and many nationalist MPs, including John Redmond, actively encouraged Irishmen to enlist in the British army. His own brother, Willie, was killed in Belgium in 1917. After independence, it became difficult for Ireland's WWI veterans, marginalised, stigmatised and shell-shocked, to even talk about the war. Such was the level of anti-British feeling. As the centenary of the war's outbreak approaches, that has changed and Irish people are ready to tell the sad stories of those who died in places such as Ypres, Messine and Loos.